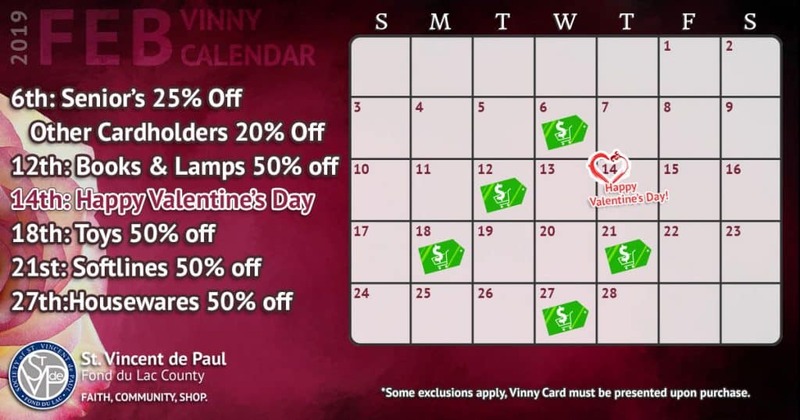 St. Vincent de Paul-Fond du Lac hopes you enjoy our February 2019 Vinny Card Sales. We have high quality, gently used merchandise at discounted prices with you Vinny Card. If you need a Vinny Card, please stop by the Service Counter and get yours for only $5.00. It never expires and allows you to enjoy the sales on this calendar. Thursday, February 14: Happy Valentine’s Day!